2 Side-by-Side Slides for two times the fun! Your Own Backyard Water Park! Our Inflatable Water Slide is constructed for years of fun, enjoyed by the whole family. 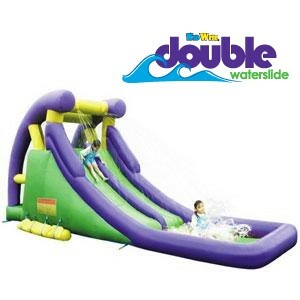 Simply hook up to your garden hose and you’ve created a cascade of water that makes this super-sized slide doubly fun! Your Own Backyard Water Park! Our Inflatable Water Slide is constructed for years of fun, enjoyed by the whole family. Simply hook up to your garden hose and you've created a cascade of water that makes this super-sized slide doubly fun! *Remember to dry completely before storing and to store in a cool dry place.